And okay, I have to admit that Concreteweb seemed to be on something like a hiatus as well for too many months – but that’s another story, and we’re back in business! 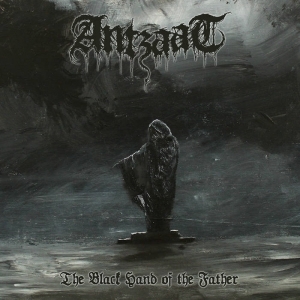 Anyway, when I received this new release, called The Black Hand Of The Father by a new band called Antzaat, I noticed the name of Ronarg. Hey, that’s the guy involved with Eratomania and Ars Veneficium, musical entities that do include this label’s owner S. as well. Great to notice, for I truly, deeply adore their material (as a matter of fact: like almost all sound eruptions on the label). Investigation taught me that Ronarg (vocals and lead guitars) started this project (or band; whatever) two years ago with drummer Eenzaat and bassist Isaroth. In mean time they’re joined by second guitar player Nihil, who initially joined the band as a live member. At the end of last Spring, the quartet recorded a couple of sonic constructions, which got eventually mixed and mastered at the famous Finnish Wolfthrone Studios. And the result is called The Black Hand Of The Father, as mentioned before, which is a debut-EP that lasts for twenty-two minutes. I listened to this five-tracker several times in mean time, and each time the result overwhelms me. Yes, it does - even though Antzaat is not exactly a band that renews the scene (at all). What these four guys bring is a fusion of Scandinavian Black Supremacy from the glorious eighties, combining the melodic and pounding heaviness of the Swedish scene, the epic bombast of the Norwegian one, and even some of the brutal undertones of the Finnish scene from that era. As from the very first tones of opening piece Disciples Of The Concrete Temple until the final breaths of the closing title track, Antzaat convince with a crafted ability; an ability to write and compose great songs, and an ability to perform these with a perfected combination of persuasion and professionalism. It fits, everything fits, whole of the time. The core lies in fast, quite aggressive riffs and pounding, pushing rhythms. Prominent bass parts, beating yet truly magnificent drum patterns and fierce guitar riffs are like the structure, on which supreme leads are woven like a web from which you can’t escape. Listen, for example, to those leading guitar riffs in Circle Of Leeches in order to create your own definition of epic (and epic it is!) worshipping. Yeah, it all sounds so natural, so logical, this organic symbiosis of elements. On top of it, well, those screams of the lead vocalist. Fire and sulphur, breathing venom and physical hatred; Ronarg’s throat could have been mutilated by Lord Melkor, you know, the sweet Vala from Tolkien’s imaginary worlds (you might better know him as Morgoth), himself. I am convinced that we, in Belgium, have some of the better throat-reapers (screamers) within the worldwide Black Metal scene, and in this guy’s case I get strengthened by my pretention. And that’s a reality, the fact that everything on this EP seems to point at a level of untouchable finesse. All five of the compositions are quite alike, yet all of them do have their own character too. The band is not afraid to inject some slower excerpts, once in a while, or to combine the melodic essence of the Nordic Pagan / Epic / Viking scene with the basics of the Scandinavian Second Wave current. And they do it without making one single failure, one single mistake. The release comes in a digital way (the label’s Bandcamp page) and on CD (in an edition of 500 copies), and it contains visual assistance, once again, by Moornebheym (having a very close professional relationship with Immortal Frost Productions). And it might seem totally irrelevant (and indeed it is, compared to the aural effort of the release), but that cover painting (by Ronarg) is so grandiose in its subtlety…!